This is a collection of football stickers that is made especially for all American football fans. Are you a fan of this sport? Do you have all the American football jerseys and merchandise you can think of? 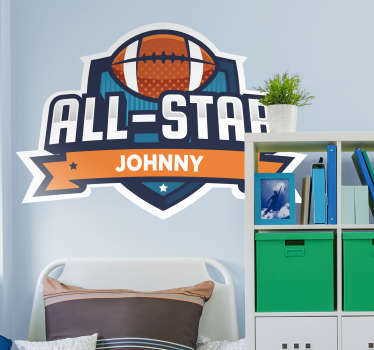 Think again, because here you will find a giant collection of stickers with tons of designs, such as football helmets, NFL players' quotes and American football player's silhouettes. All of these were designed and inspired by this great American sports game. The collection contains wall decals, helmet stickers, car stickers and more! Can't find what you want? Create your own football sticker! Send us an email or use our personalized sticker tool.